The classic Marines font with a gold Eagle, Globe and Anchor. 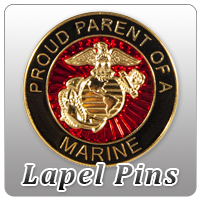 Let everyone know you are a Proud Marine Mom. This design also features the Eagle, Globe and Anchor. 1775, the year the Marine Corps was established, “United States” going down the right side vertically and with “Marines,” an EGA, and “Semper Fi” in script text. This design starts at the top right shoulder and moves towards the center of the shirt. Proud Mom design where the globe in the EGA is the "O" of "MOM". This design has two options, one for a mom of just one Marine and another for moms of multiple Marines. This grunge design reads "American by Birth, Marine by Choice" with an EGA on an American Flag. This all black design features the Eagle, Globe and Anchor with a quote. Do you have a son or daughter in boot camp? Let others know how proud you are by wearing this "Proud Recruit Parent" design featuring the Eagle, Globe, and Anchor. You select San Diego or Parris Island. This design features the text "Being a Mom is a choice, Being a Marine Mom is a Privilege" with the Eagle, Globe, and Anchor and the year 1775. Designs saying "I Love My Marine"
A blue star banner on the left pocket. I may look harmless, but I raised a Marine. This design features the Eagle, Globe, and Anchor in a red seal with "Marines" and "Semper Fidelis"
The front says “Proud Marine Dad” with either “He”, “She”, or “They” “...called me Sir First” on the back. Designs incorporating the Marine Corps into the infinity symbol. Remember those who have served our country and the sacrifices they've made. This design features a gold EGA over a vintage American Flag with the text "Corps and Country" below. "Semper Family" surrounded by a collage of other Marine related words. Digital Camo print items in your choice of colors! We've got desert, woodland, pink, blue, and purple! This is Marine Corps Digital Camo print. Traditional Semper Fi graphic with a black background and the color of the shirt is the color of the text. Our "Don't Tread on Me" design is patriotic and has historical significance. Use of the coiled snake as a symbol of American principles dates back to Benjamin Franklin and the Revoluntionary War era. “A Marine Holds the Key to My Heart” with hearts, a key and the EGA. Yellow "Semper Fi" with "United States Marine Corps" below and a grey-scale Marine Corps Seal behind. Land of the Free, Because of the Brave, The Few, The Proud! This design features navy text reading "Semper Fidelis" and a navy EGA outlined in a royal blue gradient. This patriotic design reads "Land of the Free, because of the Brave" with "USMC" and a patriotic flag heart. Semper Fido Bulldog designs on t shirts and other products. All items are officially licensed product of the United States Marine Corps. Likeness of the United States Marine Corps Flag design on clothing, accessories, and decor. A Marine and his weapon on the front of the shirt with the words “US Marine Corps” and “Semper Fi” below. This design features the Marine Corps flag in the shape of the United States with text "Sleep Well America, We've Got you Covered." This design features military members saluting a Battle Cross with antique ribbons above and below reading "For all of Our Fallen Heroes, We Salute You" and "We Thank You" underneath. Behind is a rustic American Flag. This classic design features the EGA Shop’s version of the United States Marine Corps Seal. This design proudly displays the American flag pocket size on the front and larger with the text "try stepping on this flag" on the back. MARINES. Enough said. Get your Marines gear today! This design features the word "FREEDOM" on top of a vintage American Flag. This design features both the United States and the Marine Corps flags with a gold Eagle, Globe, and Anchor and a ribbon reading "These Colors Never Run." This design features the text "Freedom, Brought to you by United States Marines" with the Eagle, Globe, and Anchor. "Marines" repeating downward in a lime green gradient with the Eagle, Globe, and Anchor on top. "Marines" going down the left side of the shirt in a grunge font. "Aint nobody tougher than a Marine....except a Marine Momma" with the American flag and EGA on the back and "Marine Mom" on the front. Designs featuring Gumby, putting a twist on the Marines' motto "Semper Fi" meaning always faithful. Semper Gumby - Always Flexible. We all know where ever our Marine's boots are that's where our heart is. Tun Tavern: The birthplace of the Marine Corps! This ladies' design features the text "Head Over Combat boots for my Marine" with hearts and the Eagle, Globe, and Anchor. This design says "My Marine has many brothers...therefore I have many sons" with a light blue line-drawn Eagle, Globe and Anchor in the background. This design is perfect for a Marine Parent! This red and blue design features the text "United States Marine Corps" with an Eagle, Globe, and Anchor and "Semper Fi" below. “My (Heart) is in Afghanistan” where the word (Heart) is actually a heart graphic with the shape of Afghanistan in a camo texture behind. This design features the text "Outta my way, I get my Marine back today!" Perfect for graduation or homecomings. Designs with USMC across the front. This design features ECG waves connecting to an Eagle, Globe, and Anchor. This is our grunge design featuring the Eagle, Globe and Anchor, and the phrase "Pain is Weakness Leaving the Body." This design is made just for the Proud Mother's of Marines, with the "MOM" spelled out using the USMC Seal as the "O"
This front of this design says “Some Heroes Wear Capes” and the back says “My Heroes Wear Combat Boots” with a graphic of combat boots. This design features the word "LOVE" with the Eagle, Globe, and Anchor as the "O" and a heart with an American Flag as the "V". Great patriotic Marine Corps design for July 4th! Our varsity-style design features Semper Fidelis with the number 75. This design features the United States covered in an American Flag with a gold Eagle, Globe, and Anchor. This design features the text "Proud Marine Mom" in red, white, and blue, with an American Flag.